Como não há uma thread (que eu saiba) só de noticias da Intel e como este Bug parece só afectar processadores da Intel em todos os Sistemas Operativos, decidi criar esta thread, visto que o problema é a nível de hardware, afecta cpu antigos (não se sabe ao certo desde quando, visto que o ainda não feito o disclose do Bug) e apesar de haver patch a nível de software, o problema só poderá ser totalmente resolvido via hardware. Este Bug é um problema de segurança, em que, sem patch, há possibilidade de leak de memória do kernel. Como disse, o Bug ainda não foi disclosed, mas a Microsoft tem vindo a testar um patch em Beta testers desde Novembro e já há um patch em Linux. Parece não haver possibilidade de fix via microcode. O problema deste Bug? O patch por software causa perdas de performance em processadores Intel, pelo menos em Linux. Nota-se em programas que usam muito I/O. Ainda não se falar se afectará muito ou pouco em Windows e ainda não vi Benchmarks em Windows e OS X.
P.S. - Não sei qual será o nome final dado a este Bug. Se um moderador quiser alterar o titulo ou mudar ou juntar com outra thread, força. Pronto já arranjaram um "estrangeirinha" para obrigar o pessoal a trocar de pc. Epá, dado o impacto negativo que isto vai ter no mercado de servidores acredita que a intel é a última a querer uma situação destas. Perdas de 30% em alguns workloads é IMENSO e vai dar uma grande vantagem à AMD. EDIT: Para os comuns mortais isto praticamente não se vai sentir pois em jogos e tarefas de encoding não há perdas de performance mensuráveis segundo os benchs do phoronix. For Now At Least AMD CPUs Are Also Reported As "Insecure"
Right now with the big mysterious security vulnerability causing the rush of the x86 Page Table Isolation work that landed in the Linux kernel days ago, it's believed to be a problem only affecting Intel CPUs. But at least for now the mainline kernel is still treating AMD CPUs as "insecure" and is too taking a performance hit. Besides my initial benchmarks of the performance impact as a result of this x86 workaround in the Linux 4.15 kernel, I've been working on various other tests since yesterday and one of them was just seeing what happens on AMD hardware. Back on 26 December is when Tom Lendacky of AMD posted a patch to confirm this PTI problem shouldn't affect the company's processors -- at least with what information is currently known. Lendacky wrote, "AMD processors are not subject to the types of attacks that the kernel page table isolation feature protects against. The AMD microarchitecture does not allow memory references, including speculative references, that access higher privileged data when running in a lesser privileged mode when that access would result in a page fault." But over one week later, that patch has yet to be merged to the mainline kernel. When booting the Linux 4.15 kernel on an AMD EPYC box, indeed, for now the AMD CPU is still treated with a bug of "insecure_cpu." 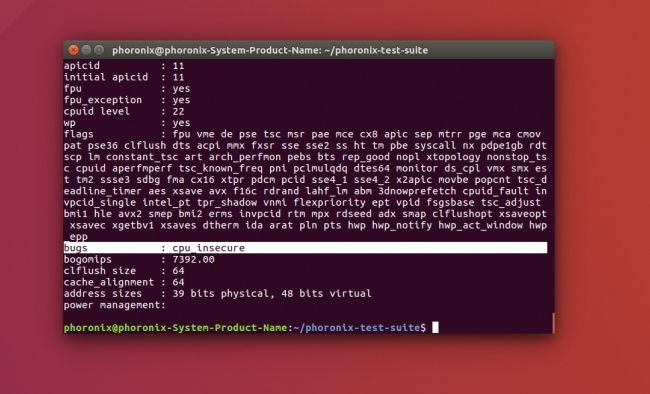 An immediate workaround at least until the AMD patch lands where PTI isn't applied to AMD CPUs is by booting the kernel with the nopti kernel command-line parameter. This can also be applied to Intel systems too on a patched kernel if wanting to regain the performance and are not too concerned about this vulnerability. In affected benchmarks (those making use of a lot of system calls, context switches, etc), indeed AMD EPYC faces a performance penalty similar to Intel. I'll have more test data to share on Wednesday. Hopefully more details on the underlying vulnerability come to light soon to really know if AMD CPUs have any chance of being affected and other details. However, recent Intel processors with PCID (Process-Context Identifiers) enabled could have the performance impact lessened somewhat. It's possible that the performance hit of the patch can be fixed by further optimization of the code. It's likely that development of this new feature (Page Table Isolation) was rushed so that users can quickly get access to a secure build of Linux. It's also likely that support for an AMD/Intel auto-detect configuration would be added at that time. Isso não sei se vai funcionar assim. Se funcionar, vai ser uma chuva de processos em cima da Intel que nem vai ser bom. Isto daria vantagem no mercado dos servidores à AMD. Achei que, para o bem do interesse público, colocar este tópico para discutir o futuro das aquisições de processadores intel. Se a AMD perder perfomance à conta disto, a Intel que prepare uns bons milhões em processor (atenção que o acesso à memoria do ryzen é diferente do intel). Processadores antigos como os sandy também vão levar este impacto ou só os mais recentes? Proxima build agora é que vai ser mesmo ryzen lol. Depende sempre do software que usas... Nao funcionam todos da mesma forma... Nao usam todos os mesmos recursos nem usam os recursos da mesma mesma forma... O proprio Windows trata a mesma APP de forma diferente em diferentes maquinas... E basicamente a mesma filosofia do August Batches dos Ryzen com o bug em Linux! Então devo de adiar a compra de um NAS com um Intel Celeron j3355 ... para precaver algum dissabor, certo ? Será que com isto os preço dos cpu´s intel vão baixar de preço? e consequentemente um aumento dos ryzen?